The farm tractor is one of the most important and easily recognizable technological components of modern agriculture in the United States. Its development in the first half of the twentieth century fundamentally changed the nature of farm work, significantly altered the structure of rural America, and freed up millions of workers to be absorbed into the rapidly growing manufacturing and service sectors of the country. The tractor represents an important application of the internal combustion engine, rivaling the automobile and the truck in its economic impact. A tractor is basically a machine that provides machine power for performing agricultural tasks. Tractors can be used to pull a variety of farm implements for plowing, planting, cultivating, fertilizing, and harvesting crops, and can also be used for hauling materials and personal transportation. In the provision of motive power, tractors were a replacement for human effort and that of draft animals, both of which are still used extensively in other parts of the world. The heart of a farm tractor is a powerful internal combustion engine that drives the wheels to provide forward motion. Direct ignition (diesel) and spark-driven engines are both found on tractors, just as with cars and light trucks. Power from the engine can be transmitted to the implement being used through a power take-off (PTO) shaft or belt pulley. The engine also provides energy for the electrical system, including the ignition system and lights, and for the most recent models, air conditioner, stereo system, and other creature comforts. 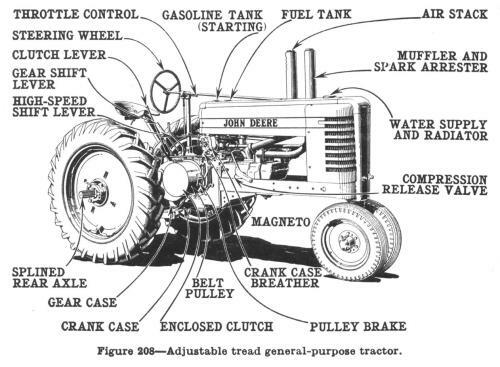 The drawing below, taken from an undated John Deere operating manual, shows a typical general-purpose tractor from the period around 1940. The machine is little more than an engine on wheels, with a seat for the operator and a hitch for pulling implements centered in the rear. Later models would feature an enclosed cab to keep the operator out of the weather, but this model features only simple controls and the metal seat. The drawing shows a wheel-tractor, which comprised more than 95% of machines sold for farm use. Tracked units, also called crawler tractors, were common in California, and of course, dominated construction and other non-farm uses for tractors. Farmers in 1900, whether engaged in growing wheat, corn, or cotton, raising livestock, producing dairy products, or combining a variety of these or other products, had only two sources of power aside from their own strength: steam engines and draft animals. Steam boilers provided motive power for threshing small grains, and a very small number of farmers were using recently-developed steam traction engines for plowing and other arduous tasks. Draft animals provided most of the power on all types of farms, however. As of 1910, there were more than 24 million horses and mules on American farms, about three or four animals for the average farm. In addition to supplying farm power, the horses were also relied upon for transportation, of both goods and people. Horses and mules pulled an impressive variety of farm implements at the turn of the century, including plows, disks, harrows, planters, cultivators, mowers, and reapers. Several important farm tasks were typically done by hand at this time, including picking of corn and cotton. The greatest amount of power was needed for plowing, often forcing farmers to keep one or two extra horses above the number needed for the remainder of the year. As an example, power requirements during plowing have been estimated at 60% of the annual total needs for growing wheat at that time. A new source of power, then, would be valuable to the farmer if it could replace the horsepower requirements of plowing, as long as the cost was less than that of maintaining one to two extra horses. It would be even more valuable if it could economically replace all of the functions currently performed by draft animals, and further if it could facilitate automation of the cotton and corn picking operations. As early as the 1870s, engineers had succeeded in producing steam traction engines, referred to today as steam tractors. These monsters, weighing in excess of 30,000 pounds (excluding water), could move under their own power, and had impressive horsepower capacity. Unfortunately, their size, mechanical complexity, and constant danger of explosion made these traction engines unusable for most farms in North America. In all but the driest soils, steam traction engines tended to become mired in the mud and refuse to move. Because of these handicaps, the use of steam tractors increased slowly in the United States during the last two decades of the nineteenth century. Annual production of less than 2000 units per year in the 1890s had increased to around 4000 in the ten years after 1900. Nonetheless, the rate of growth of steam horsepower was far smaller than the growth in animal horsepower. For the reasons mentioned above, adoption of steam power was clearly not a candidate to replace the horse. With the commercialization of the internal combustion engine, a more practical alternative emerged. Farmers bought large numbers of stationary gasoline engines in the first decade of the twentieth century, and quickly became familiar with their operation. A wide variety of household chores were simplified by the use of stationary engines, including pumping water, washing clothes, and churning butter. Companies began developing gasoline-powered traction engines during the same period; the first commercial machines were sold in 1902, and quickly became known as ‘tractors’. The first tractors shared similar traits to the steam traction engines. Weighing between 20,000 and 30,000 pounds, with huge steel wheels or tracks, these models were large and expensive. Fairly quickly, the large manufacturers, including Hart-Parr, International Harvester, Case, and Rumely had reduced the size and cost. By the time Ford introduced its Fordson model, the first successful small tractor, average weights were down to 2000-6000 pounds, and prices were under $1000. These tractors proved to be excellent at plowing, and were quite capable of driving mowers and reapers. The large steel wheels, low clearance, and substantial weight made them unsuitable for cultivating growing crops like corn and cotton, however. Henry Ford, who had tinkered with steam and gasoline tractors prior to achieving his success with automobile production, introduced a small, inexpensive model which he called the Fordson during the World War I. This model sold well for several years, aided considerably by a war-caused shortage of horses. After a post-war crash in farm prices drastically reduced sales in 1920-21, Ford initiated a price war in 1922 by cutting the price of its Fordson from $625 to $395. Alone of the large competitors, International Harvester matched Ford’s price, and sales boomed for those two firms throughout the rest of the 1920s. Ford’s production of tractors were always a sidelight to his main business of manufacturing automobiles, however, and when the Fordson production lines were needed for the critical Model-A launch in 1928, Ford decided to leave the tractor business. The competition with Ford drove International Harvester to make significant improvements in its tractors. The first innovation to appear was the power take-off, offered after 1922. This device, a metal shaft turned by the rotation of the tractor motor, allowed implements to be driven directly by the tractor engine, as opposed to obtaining power from a wheel rolling along the ground. The power take-off quickly became a standard feature on all tractors, and implement makers began the process of re-designing their equipment to take advantage of this innovation. An even more important improvement by International Harvester was the introduction of a general-purpose tractor, the Farmall, in 1925. This model, with high ground clearance, small front wheels, and minimal weight, was designed for cultivating, as well as for plowing and cutting. It was tested in Texas in 1923, and was released for broad scale distribution in 1925. Competitors, such as Deere, Massey-Harris, and Case rushed to develop a general-purpose tractor (a ‘GP’) of their own, and by the mid-1930s, GPs had replaced the standard Fordson-type tractor. In addition, these same firms began the process of modifying their implements for these tractors, and the wholesale replacement of the horse began in earnest. Three other improvements were critical in completing the technology base for the tractor. Deere released a power lift for its models beginning in 1927. This device allowed the implement to be raised before every turn by pulling a lever. Prior to this, the farmer had to lift the implement by hand at each turn, which was a time-consuming and enervating task. As with the power takeoff, the power lift was rapidly adopted by other tractor makers. Rubber tires first became available for tractors in 1932, and by 1938 had largely replaced steel wheels. The low-pressure tires not only did less damage to fields, but also allowed a higher forward speed, due to reduced friction. Finally, the development of diesel engines in the mid-1930s gave farmers access to a lower-cost fuel for their machines. Many tractors from that time forward had a small gasoline tank for cold starts, and a large diesel tank for the majority of the operation. International Harvester pioneered a ‘one plow’ tractor at about this time, and began selling it in 1934. This tractor was smaller and less expensive than the original Farmall, but had the same general-purpose capabilities. Its introduction offered operators on small farms the chance to replace their one horse or mule with a tractor, and was responsible for the beginnings of the tractor’s diffusion in the South. These small tractors often featured adjustable front wheels and high ground clearance, which made them considerably more flexible than the larger models. Within a few more years, manufacturers were offering their larger models in ‘high-clearance’ versions as well. A final innovation was responsible for bringing Ford back into the tractor business in 1937. In that year, the firm agreed to enter into a joint venture with Irish inventor Harry Ferguson. Ferguson had worked for almost 20 years to perfect a ‘three-point hitch,’ a device that produced superior plowing by continuously leveling the implement as it traveled over uneven terrain. The Ford-Ferguson tractors quickly amassed a significant market share (14% by 1940), and the hitch design was rapidly imitated. By about 1938, the technology of tractor development had achieved what is known as a ‘dominant design.’ The Farmall-type general-purpose tractors, both large and small, would change little, except for increasing in size and horsepower, over the next 30 years. Beginning in the mid-1930s, and despite the ongoing depression in the United States, tractor sales increased rapidly. 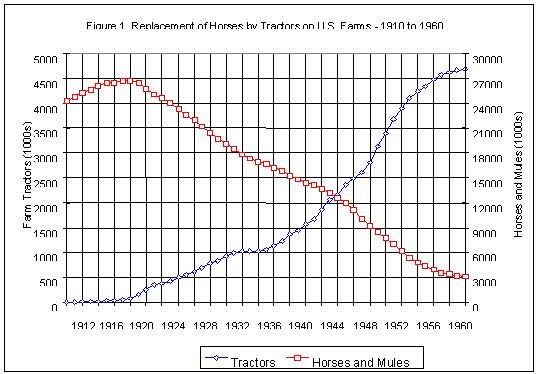 Figure 1 shows the number of tractors on farms from 1910 through 1960. By the latter date, the process of technological diffusion was essentially complete. With the exception of the deep South, the increase in percent of farms with tractors from year to year had stopped. The general-purpose tractor proved to be an excellent replacement for the horse in plowing, soil preparation, planting, and cultivating tasks for a wide variety of field crops. In addition, the tractor was fully capable of providing power for mowing hay and for harvesting of wheat and other small grains. In the latter application, it facilitated the practice known as ‘combining,’ the simultaneous reaping and threshing of wheat. Horse-drawn combines had been available since the 1880s, and had found limited acceptance on the larger farms of the arid West. However, a large team of horses was required to drag the heavy, complex machine through the fields. The tractors of the 1930s and 1940s had no trouble pulling a re-designed combine, and they began a process of rapid adoption in the Midwest. Eventually, a self-propelled combine was produced, with the tractor engine and cab subsumed into the combine apparatus. The general-purpose tractor was not capable of bringing mechanization to the corn and cotton harvest until separate, but related innovations produced a corn picker in the 1920s and a mechanical cotton picker after the Second World War. Prior to the development and adoption of the corn picker, corn was often cut with a binder, followed by manual shelling. One of the more important uses of stationary gas engines early in the twentieth century was for the shelling of corn. The picker combined the operations of cutting and shelling, and also distributed the stalks back onto the field, eliminating an additional step. Mechanical cotton pickers fundamentally altered not only the harvesting of cotton, but the very nature of cotton growing in the United States. The mechanical picker, even after extensive development, produced higher crop losses than hand picking in the hot, humid areas where most cotton was grown — Mississippi, Alabama, and east Texas. In the dry areas of west Texas, however, the picker was very efficient, both in terms of labor effort and crop yields. The mechanical cotton picker thus precipitated a relocation of cotton production westward, resulting in large-scale migration out of the deep South in the years after World War II. As with the combine, self-propelled corn and cotton pickers were soon developed, combining the power train and cab of the tractor within the implement’s apparatus. For this reason, pickers and combines are often considered as separate machines, and their development and diffusion are not included in discussions of the impact of the tractor. It should be pointed out, however, that none of these devices could have been powered efficiently by horses or steam; the gasoline-powered tractor was necessary for their development. As such, I will include combines and mechanical pickers in assessing the impact of the tractor on inputs to agriculture. The recent history of tractor development is less dramatic than the first 50 years. The peak year of tractor production was 1951, during which 564,000 units were made. From that time, the approaching saturation of the market produced a steady fall in production and sales. As one might expect, manufacturers responded by developing ever-larger tractors to supply farms that were growing in size. Interestingly enough, this pursuit of size left the small end of the market open to foreign competition, and, as in the case of the U.S. automobile industry, imports grew to dominate the small-tractor market. Creature comforts have been improved markedly since the 1950s as well. Enclosed cabs soon had heating and air conditioning, and are now likely to be supplied with a television and stereo-CD. As a result, modern tractors are quite comfortable in comparison with the machines of 40 years ago, let alone versus the monsters of the early tractor era. From a slow start in the 1920s and 1930s, tractor production grew through the late Depression years, as farmers increasingly parted with their horses and mules. 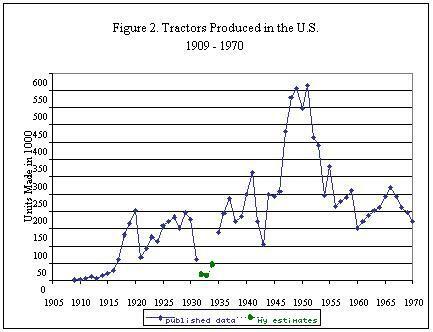 Figure 2 shows the annual output of farm tractors from 1909 to 1970, including the peak years of the early 1950s. It is likely that this peak would have been reached much sooner, had it not been for the disruption of the Second World War. Not only were raw materials such as steel, copper, and rubber severely limited due to wartime production needs, but the government actually limited the total number of machines that could be built each year, and allocated only the raw materials needed for that production. Many of the tractor factories were converted over to production of tanks, airplanes, vehicles, and other military goods. Despite the presence of corporate giants such as International Harvester and Ford in the early development of the farm tractor, there were hundreds of firms that began producing or selling machines in the first two decades of the twentieth century. As is the case with many emerging industries, inventors, entrepreneurs, and promoters were attracted to this important and rapidly-growing field. The agricultural depressions of 1920-21 and 1930-32 drove many of these firms into mergers or out of business, and by the early 1930s seven companies dominated the industry. These firms, along with Ford, would make almost all of the wheel-tractors sold in the United States from 1930 through 1955. The dominance of the seven firms is shown in Table 1, which presents market share data by decade for the key years of tractor industry growth. As discussed above, Ford dominated the market in the 1920s, then left the business to create production capacity for the Model A; upon returning to tractors in the 1940s, Ford once again became an important presence. International Harvester was the largest consistent seller, as well as being the technological leader, while Deere would grow into the most significant challenger. By 1963, Deere overtook International Harvester in a declining market, and remains the largest presence in agricultural equipment today. The farm tractor had made a major impact on the social and economic fabric of the United States. By increasing the productivity of agricultural labor, mechanization freed up millions of farm operators, unpaid family workers, and farm hands. After the Second World War, many of these people relocated to the growing cities across the country and provided technically-skilled, hard-working labor to the manufacturing and service industries. Millions of others remained in rural areas, working off-farm either part-time or full-time in a variety of professions. The landscape of the country has changed as a result. Farms have grown larger as one proprietor can manage to cultivate the land that several families would have worked in 1900. Small market towns, especially in the Plains states, have almost ceased to exist as the customer base for local businesses has dwindled. Land formerly devoted to raising and feeding horses has been converted to alternate uses or reverted to grassland or forest. Several generations of agricultural families have experienced the sadness of giving up the farm and the rural way of life. On balance, however, the tractor has had a markedly positive economic impact. Horses and mules, while providing farm power, ate up more than twenty percent of the food they helped farmers grow! By replacing them with machines that consumed much less expensive quantities of fuel, oil, and hydraulic fluid, farmers were able to reduce their costs and pass these social savings along to food buyers. More importantly, the millions of farm workers freed up by the technology were able to contribute their labor elsewhere in the economy, creating large economic benefits. According to a recent estimate by the author, the U.S. would have been almost ten percent poorer in 1955 in the absence of the farm tractor. Along with the revolution in yields generated by the advances in biological and chemical research, the farm tractor has helped agriculture make a significant contribution to economic growth in the United States. Ankli, Robert E. “Horses vs. Tractors on the Corn Belt” Agricultural History 54 (1980): 134-148. Berardi, Gigi M., and Charles C. Geisler, editors. Social Consequences and Challenges of New Agricultural Technology. Boulder, CO: Westview Press, 1984. Broehl, Wayne G., Jr. John Deere’s Company. New York: Doubleday, 1984. Clarke, Sally H. Regulation and the Revolution in United States Farm Productivity. Cambridge: Cambridge University Press, 1994. Gray, R. B. The Agricultural Tractor: 1855 – 1950. St. Joseph, Michigan: American Society of Agricultural Engineers, 1954 (revised, 1975). Griliches, Zvi. “The Demand for a Durable Input: Farm Tractors in the United States, 1921-57.” In The Demand for Durable Goods, edited by Arnold C. Harberger. Chicago: University of Chicago Press, 1960. Hayami, Yujiro, and Vernon W. Ruttan. Agricultural Development: An International Perspective. Baltimore: Johns Hopkins Press, 1971. Jasny, Naum. Research Methods on Farm Use of Tractors. New York: Columbia University Press, 1938. Jones, Fred R. Farm Gas Engines and Tractors, fourth edition. New York: McGraw-Hill, 1966. McCormick, Cyrus. The Century of the Reaper. Boston: Houghton Mifflin, 1931. Rogin, Leo. The Introduction of Farm Machinery in Its Relation to the Productivity of Labor in the Agriculture of the United States during the Nineteenth Century. University of California Publications in Economics: Volume 9. Berkeley: University of California Press, 1931. Sargen, Nicholas Peter. “Tractorization” in the United States and Its Relevance for the Developing Countries. New York: Garland Publishing, 1979. Schultz, Theodore W. “Reflections on Agricultural Production, Output, and Supply.” Journal of Farm Economics 38 (1956): 748-62. Whatley, Warren C. “Institutional Change and Mechanization in the Cotton South.” Ph.D. dissertation, Stanford University, 1983. White, William J. “An Unsung Hero: The Farm Tractor’s Contribution to Twentieth-century United States Economic Growth.” Ph.D. dissertation, Ohio State University, 2000. Wik, Reynold M. Steam Power on the American Farm. Philadelphia: University of Pennsylvania Press, 1953. Wik, Reynold M. Benjamin Holt & Caterpillar: Tracks & Combines. St. Joseph, Michigan: American Society of Agricultural Engineers, 1984. Williams, Robert C. Fordson, Farmall, and Poppin’ Johnny. Urbana, Illinois: University of Illinois Press, 1987.